Do you love paper, colorful patterns and crafting? Then you'll love to learn how to use decorative paper to cover picture frames and create a fun and unique piece for your home or gift for a friend! Lizzie from Craftbelly Paper & Pattern has been covering unfinished wood frames for years and wants to share with you her favorite tricks for getting those corners just right and avoiding bubbles in the paper. You will get to choose from a variety of beautiful decorative paper and standard frame sizes and make your very own frame to take home! I will provide all materials, including frames, decorative paper and all tools/supplies. 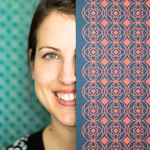 Lizzie Greco is the creative and crafty lady behind the local small business, Craftbelly Paper & Pattern. She started covering wood frames with decorative paper 6 years ago as a creative outlet from her day job and hasn't looked back! She has since started a business selling her patterned frames, along with other paper goods such as notebooks and wrapping paper, all featuring her own designs. When asked how she gets the paper so smooth and corners so tightly wrapped, she always answers with a hearty laugh and says, "lots of trial, error and curse words." Having wrapped more than 1,000 frames over the last several years with paper, she has picked up some tricks along the way that she hopes to share with her students so that they can go home and cover pretty much anything they want with paper.